The award-winning Marco Beach Ocean Resort, located along the Gulf of Mexico’s famous white-sand beaches, has completed a comprehensive renovation of its one and two-bedroom suites. Additional updates have also been completed on the resort’s Gulf Ballroom. The award-winning Marco Beach Ocean Resort, located along the Gulf of Mexico’s famous white-sand beaches, has completed a comprehensive renovation of its one- and two-bedroom suites. Additional updates have also been completed on the resort’s Gulf Ballroom. The updated luxury interiors capture the essence of the boutique resort’s beachfront location in a palette of soft blues and mint greens against white and sandy-hued backdrops, with warm and washed wood tones, linen-inspired upholstery, and elegant mirror and satin nickel surfaces. “The rooms have a lighter look but retain a sophisticated ambience,” said Ron Albeit, general manager for Marco Beach Ocean Resort. Each of the 78 one-bedroom and 15 two-bedroom suites offers a kitchenette, spacious living room and private balcony overlooking the Gulf of Mexico or lush garden terraces. Smart TVs were also installed in each suite and allow complimentary access to the internet. 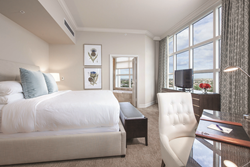 Marc-Michaels Interior Design was the interior designer for both the new guest suites and Gulf Ballroom. The redesign of the Gulf Ballroom replaced Tuscan colors, treatments and traditional aesthetic with soft grasscloth walls, carpeting with deep turquoise undertones, and sandy draperies that frame Gulf views through large picture windows. “The lighter colors highlight the ballroom’s incredible Gulf of Mexico views and minimize the separation between indoor and outdoor spaces,” said Albeit. Known for its Gulf-front location, breathtaking views, intimate environment and personalized service, Marco Beach Ocean Resort features a variety of dining options ranging from beachfront casual to authentic Italian cuisine at the elegant, award-winning Sale e Pepe restaurant; spa and fitness center; rooftop garden; and direct access to four miles of the island’s famed sugar-sand beaches. The resort’s location and amenities make it the perfect choice for vacations, destination weddings and executive business meetings. Overlooking the sparkling blue waters of the Gulf of Mexico, Marco Beach Ocean Resort is a designated AAA Four Diamond resort and was ranked No. 16 on the Travel + Leisure 2013 World’s Best Awards List of Top Resorts in the continental U.S. In 2015, the resort earned the Wedding Wire Couples’ Choice Award; was recognized by Conde Nast Traveler as one of the top 25 resorts in Florida’s Gulf of Mexico and Central regions; was named among the top 400 hotels worldwide by Expedia+ members; and was inducted into the TripAdvisor Hall of Fame. Sale e Pepe earned its 11th consecutive Best of Award of Excellence from Wine Spectator magazine, maintaining its distinction as the only restaurant on Marco Island to receive this level of recognition. It has been recognized as a AAA Four Diamond award-winning restaurant each year since 2006 and recently was ranked No. 2 among Marco Island’s top restaurants on USA Today’s 10 Best Readers’ Choice Awards. Reservations are preferred and can be made by calling 239-393-1600 or visiting sale-e-pepe.com. Developed by one of the Gulf Bay® Group of Companies, Marco Beach Ocean Resort is located at 480 South Collier Blvd. on Marco Island. Shopping, entertainment and dining are all within walking distance; golf, boating, fishing, kayaking and nature tours are nearby. For additional information or to make reservations, call 239-393-1400 or toll-free at 800-715-8517, or visit marcoresort.com. Aubrey J. Ferrao is President of Gulf Bay Group of Companies.